Hello everyone and happy Thursday. Oh and happy Valentine's Day! :) Hope everyone can spend the day with your sweetie. So yesterday i had this craving or eggs, bacon,and fried potatoes. So that's what i had for lunch,and supper. lol I was sure satisfied after i ate that. Must of been a protein kick craving. Well it was good, Today i haven't had the craving for that. I am hoping that when he get's home we are gonna have a little movie in at home, With are new TV are surround sound is pretty awesome. :) we love it. Were suppose to anyway. So we will see how that goes. 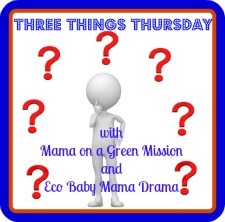 Well, I am linking up with a new link up called three things Thursday. I kinda just saw this on another blog and thought it looked liked fun. So i am gonna go back to week 1 and get caught up with this link.It looks interesting to do. So here is Three Things Thursday. 2. Used to have 2 wholes in both ears but top ones closed. 3.was thinking about getting nosed pierced but i didn't want to after trying the magnetic nose rings. lol. No. but would like to get one some day. Pet's and names?Could be pets from the past. 3 Went to Kingwood center. For me it's three things i love about my boyfriend. 1.His love- he loves me for me and excepts who i am. 2.His heart-he has such kind hart and i love it. 3.The little tiny things he does everyday that makes me happy. 1.Proposed to me at applebee's last December and brought me a ring. 2.Bought me flowers and a new movie i wanted. 3.Bought me a cake one time when i was craving something sweet. Thanks for joining us so we can get to know you!